Lipstick Stun Gun Best Seller and Price ON SALE! The most powerful lipstick stun gun on the market delivers 3 million volts and 4.1 milliamps of pure power to any attacker, and it's available at DefenseDevices.com. This lipstick look-alike is just 5 inches long and 0.875 inches in diameter, and it looks just like an actual lipstick container (although it is a little larger). A built-in flashlight makes it even more useful. 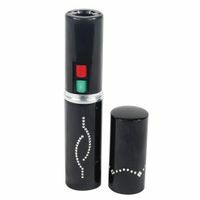 This lipstick stun gun is easy to use because the buttons are easy to distinguish. Green is for the flashlight, while red is for the stun gun. There is no disable pin; this baby is ready to go as soon as you remove the cap. Isn't your self defense and peace of mind worth it? Sometimes referred to as a lipstick taser, it now comes in gold. This is the same Stun Master Lipstick Stun Gun found on other websites for up to $22 or more. We all get them from the same importer. This stun gun comes with a charger and detailed instructions, as well as a 3-year warranty that protects you against manufacturer defects. Residents of Illinois (excluding Chicago) must fax a current FID card to us, and residents of Wisconsin must fax a concealed carry permit to us at 888-345-2533 in order to purchase a Taser or stun gun. Same exact model selling for $21.99 elsewhere. Our everyday price is lower than their sales prices.